My short story “Our Lips Are Sealed” — about a woman who may be having an unusual experience with her wine glass collection — is now available in Sediments Literary-Arts Journal‘s A Haunting issue. It takes its place next to several wonderful ghost stories (I especially loved Adam “Bucho” Rodenberger’s “Welcome to the Fireworks”) and hauntingly beautiful artwork (a favorite of mine is Amanda Bess Allen’s “Sleepy Hollow”). On a personal note, what’s even cooler is the editor referenced “Our Lips Are Sealed” in her introductory note! Best enjoyed with a bottle, you can check out everything in the issue here and read “Our Lips Are Sealed” here. The cover of the print edition of A HAUNTING. 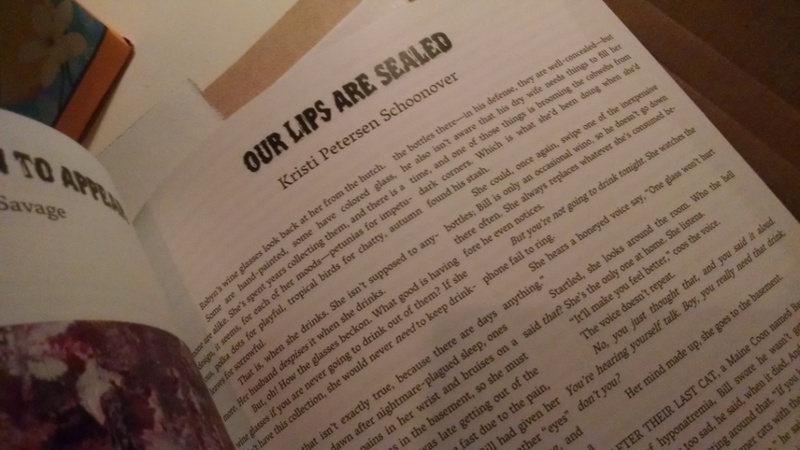 “Our Lips Are Sealed” gets a mention in the editor’s introductory note. Posted on November 17, 2015, in Horror Stories, News, Short Stories and tagged A Haunting, art, drawings, fear, fiction, Halloween, Horror, literary magazine, paintings, photography, poems, Poetry, scary, Sediments Literary-Arts Journal, Short Stories, visual art, wine glasses. Bookmark the permalink. Leave a comment.